I have been playing Guild Wars 2 off and on for about a year now. And by off and on, I mean I bought it about a year ago, played a few weeks, and didn’t really like it, so I stopped playing. Then, a couple months ago, I felt like trying something new, and that $50 I dropped called out to me from the grave, and I thought I’d give it another shot. First, a little more on my history with Guild Wars. I never played the first one. This was probably due at least in part to the fact that I played RuneScape for more years than I care to count, and I always felt like there was a kind of rivalry between Guild Wars and RuneScape (or, perhaps more accurately, their respective players). Maybe it’s because they both had payment models that were variations on what would now be called “freemium” — Guild Wars didn’t require a subscription fee, but released frequent expansions, and Runescape was free to play… unless you wanted to actually experience the whole game, in which case you have to pay a (modest) subscription fee. Maybe it’s because they were both gateway drugs to World of Warcraft. Maybe it’s because the three aforementioned MMOs, along with EverQuest 2, were pretty much it in terms of AAA MMOs when I started playing them (and, come to think of it, the “AAA” label could be debated for some of those). Whatever the reason, I really wasn’t interested when I heard there was to be a new Guild Wars. Guild Wars was, in my mind, a mediocre MMO that people played because they were too poor to pay a subscription. Then, as often happens, one of my friends started playing it and talked me in to buying it. It was on sale, so I figured why not? A one-time fee isn’t so bad. Unfortunately what my friend (and, perhaps more at fault, the game itself) failed to convey to me was just how different of an MMO Guild Wars 2 is from the typical WoW formula. The game is not “pick up quests, kill 10 rats, return to questgiver for gold and gear” like just about every MMO out there. It’s more about exploration than killing all of the things. It’s such a big paradigm shift that at first I didn’t like it. Now I’m glad I came back and gave it another chance. Enough about the past. Let’s talk about the present. Meet Isoni, my level 39 Engineer. I’ve tried several of the classes in GW2, and the engineer is probably my favorite. My elementalist, Incendiary Lemons, was pretty close, but the engineer has held my attention longer. One of the things that annoys me (even still) is that the combat in GW2 is so dumbed down. I have exactly 5 weapon skills, and can choose 3 slot skills and a heal (usually a self heal). That’s it. Some might complain about having 3 or 4 hotbars crammed full of situational skills and cooldowns in some games, but to me that’s what MMOs are about. Yes, I understand they did this so you could focus on running about and dodging, but that only gets me so far. The reason why I like the engineer is that I can do my normal rotation of skills, then pull out a flamethrower or grenades if the situation calls for it (or if, y’know, I just feel like setting people on fire). Same with the elementalist. Each of the four Last Airbender classical Greek elements is a different experience: fire is for big hits, and if I get bored with that, I can switch to the DoT-heavy earth, or the multi-target air. Or, in group settings, I can pull out the healing/CC abilities of water. I’m getting close to the make-or-break point of MMOs: will I make it to the endgame? Or will I get bored and stall out? Flat leveling curves are helping, as is having friends in the game. 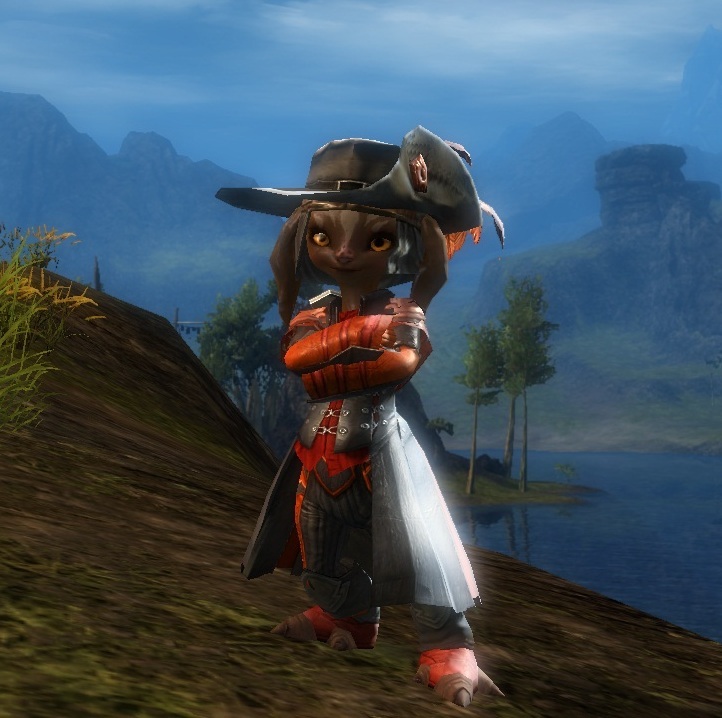 Keep watching here to see how my Guild Wars 2 journey progresses!